Are you trying to live a more homespun seasonal life, maybe thinking about homesteading? Maybe you’ve already begun taking steps to live a life that is built from your own hands but are wondering how to sustain it for the long-term. It doesn’t matter if you’re living in the city or in the country, there are some things everyone can do to get and stayed prepared for a life that can sometimes be unpredictable. There are ways we can accomplish a little personal security and homestead preparation through small things and steps. It is not about having a large savings account or an entire year’s supply stored in the food pantry, though those are good things, it is more about having a small supply and the necessary skills and attitude to make it work, it's all about homesteading for sustainability. If you are currently using credit cards to make ends meet or for splurges and only making the minimum payments, stop that now. I strongly suggest getting out of debt, as well. It seems owning things free and clear is the only way to ensure the homestead will remain your property. Avoiding debt means no money spent on interest, finance charges, late fees, etc., meaning more money stays in your home economy not the economy of some bank that has the right to change terms at will. Try to think in terms of living below your means, not just within them whenever possible. Save whatever you can pull together. Look for ways to build yourself a reserve that will help see you through unemployment and/or unexpected expenses. Start small and find a local bank with a good reputation and a high interest rate and let your money grow. I do recommend keeping some money on hand for those times when the bank is closed, as well. Start stocking your food pantry when you find good sales, are offered surplus from someone’s garden, and/or find some wild foods worth keeping. Learn to can, freeze, and dehydrate and do so whenever possible to keep your pantry and your stomach full. A well-stocked pantry may be more valuable than money in the bank, so do keep yourself and your family well prepared for any emergencies with nutritious food in the pantry. It goes beyond food items, however; think candles,blankets, wood for heating, first aid items, batteries, and other items you feel necessary (toilet paper?). In daily homesteading activities, our communities help us in numerous ways. Let’s face it – in times of emergency, whether natural disaster or economic difficulties, it’s our neighbors who, we’ll need to rely on and who will rely on us. These are the folks we can turn to for bartering goods and services, who can teach us skills, and much more. This doesn’t mean you have to best friends, it just means you have to know them and know who has what skills if at all possible. It sure makes it easier to borrow a cup of sugar or a wheelbarrow if you’ve actually talked to your neighbors previously. I’m talking about skills that you can use to barter and/or sell if times get really tough. If you already know how to repair a roof, mend torn pants, bake bread, can, etc. you have something other folks might want and they might know how to darn a sock, hunt for venison, make sausage or do something else valuable in return. It is also much easier to do some of these things yourself than have to find someone in an emergency. Get good first aid skills in place too, these are invaluable. It’s much easier to simplify your daily life now and adjust slowly versus adapting to a giant change. Think of ways to simplify now, whether its turning off the TV and computer and spending more time reading or cutting out the lattes in favor of adding to your reserves. Cut back on TV and internet and opt for handicrafts or simply sitting and enjoying the company of loved ones. How about you? 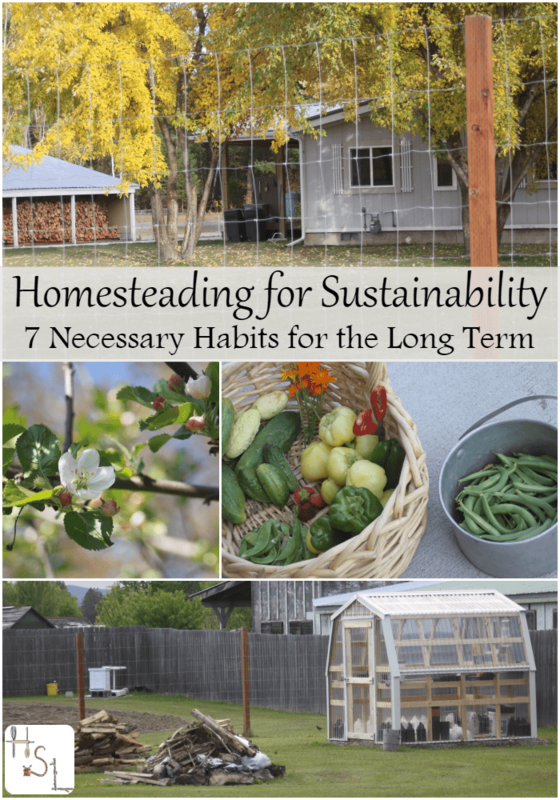 How are you managing your home economy and homesteading for sustainability? What would you add to the above list? What great tips. I especially loved staying out of debt, being thankful and simply. Shared! I really liked this. The part about living simply and doing a more gradual change is seriously true. We have been on that path for the last few years, and this past year we moved to a homestead and if we hadn’t already been making changes, it would have been such a shock to the system. Thank you so much for sharing your experience! I can’t wait to check out your blog too. Gratitude makes such a difference – I’m so glad you put it on the list! It seems overly simplistic but I think gratitude is probably the most important part of life in general. Thank you for taking the time to share your knowledge of homesteading !!!!! I am very lucky to find your blog. God bless you!!!!! Thank you so much for stopping by and saying hello! Yes, yes and yes! I whole-heartedly agree! Thank you for sharing! Thanks! We do all of these and have fun growing what we need. Author Spring Warren has a great recipe for Roasted Vegetables sauce that has inspired a whole slew of recipes. As a homesteader myself, this is a very accurate picture of what habits need to happen if you plan to be sustainable long term. Well written! Very good commonsense advice.I’m 66 and retired. Growing up I lived in a small nearby city. We had a big backyard unlike anyone else aroynd us. It was my grandparents house and had been an urban farm until the city made farm animals unacceptable. We had a big garden that was shared . My mom and her sisters canned. They worked hard for everything. Keep credit cards for a real emergency with 0interest. If something has no use,junk it ,sell it or donate it. Keep the useful stuff and some sentimental items. We downsized from our farm to a small village house. Plant some fruit trees and a garden. Swap. Learn to be prepared in an emergency. My husband makes maple syrup from our front yard trees. I am turning our small space into a tiny homestead. A nice lawn is useless. None of pur neoghbors would have a clue what to do in an emergency. Everyone expects someobe else will take care of them.